Typically do not meet on the week end of an outdoor event. Call for specific information. Outings: The Scouts try to have one camp-out or another event each month. Events: Troop activities are not limited to just camping! As a Scout run Troop, the Scouts plan and experience events of interest to the members of the troop. For example over the last two years, the Scouts have gone on a white water rafting trips, caving adventures, backpacking trips, numerous camping outings, the National Jamboree, attended National Youth Leadership Training, spent a week sailing or experiencing pioneer living at summer camp, hiking treks, attended a week long summer camp (Camp Frontier (Ohio), Camp Ockanickon SE PA), went on sightseeing trip to Washington Smithsonian Air and Space Museum, helped with a number local service and Eagle Scout projects, skiing / snowboarding, collected food for the BSA Scouting for Food program, attended Scout Sunday and helped local Cub packs, etc. Planned for the upcoming year are adventures like camping at Pennsylvania State Parks (Grand Canyon), NBOF Rendezvous (HVSR), Survival Skills Competition (HVSR), winter camps at the Elk Mountain Ski Resort,Pioneer District's Klondick Derby, summer camp at Resica Falls, PA, hiking, canoeing, kayaking and camping trips, skiing / snowboarding, white water rafting, etc. 2016 was an exciting Klondike for Troop 88. As most of you know, we were picked to run Klondike this year. The troop was in charge of setting up all of the stations and getting people to man each one. Thanks to Mr. Wagner and the tons of volunteers who put in countless hours, it went flawlessly. We had lots of fun stations, from slingshots to first aid. My personal favorite was the two-man saw station because it is something you don’t get to do every day. This year was also very special because it was the first in many that we had a sled place. Troop 88’s own King Cobra’s sled came in third place out of the entire district. Great teamwork Troop 88!! The Appalachian Trail cleanup was a project that was designed to not only clean the trail, but to restore and beautify it, and, as a member of the team of volunteers, I helped to do all of those things. The project began with a briefing of what was needed to be done. This included picking up litter and digging drainage trenches alongside the trail. While heading to the parts of the trail that needed the most restoration, we were always on the lookout for bits and pieces of litter that needed to be picked up and thrown away. When we arrived at our destination, we began to dig the drainage trenches, and we also removed any debris that would render the trenches ineffective. We worked on this for several hours and covered a good amount of ground. After the hours of work, we headed back to the place where we had originally gathered, and it was there where we cleaned the tools used that day and the litter that was collected. I believe the cleanup was a good experience for not just me, but all of the participants because it taught us how our hard work influences others and how we can all give back to our community. Aside from the Saturday morning snow, the Scoutmaster Surprise Campout was definitely a surprise. On this campout, scouts were put in the scoutmasters shoes; their job was to teach the scoutmasters the required skills to achieve the ranks of 2nd and 1st class Assistant Scoutmaster. These skills included knot tying, first aid, and more. It wasn’t just scoutmasters learning either, many younger scouts learned how properly use tools in the axe yard. This Campout also included a five mile hike (which if you ask me was more than five miles) that was full of fun and snow. While it was awkward for scouts and scoutmasters at first, both learned a lot on this campout and we can't wait to see what the scoutmasters have in store for us next year. 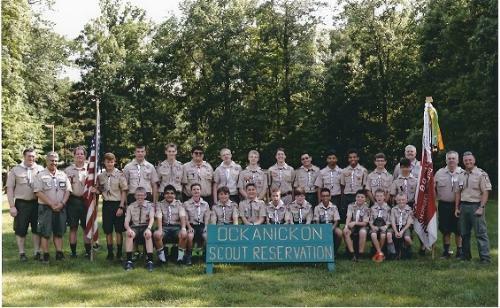 For this weekend, a few scouts went out to Camp Tuckahoe to participate in the Order of the Arrow events, whether it be getting their Ordeal or working to help set up camp. On Friday, when we arrived, we went through registration and then the members separated from the candidates, with the candidates going to the Scout Pavilion and the members going to put their gear in a cabin then hanging out with a cracker barrel late at night. In the morning, members woke up to get breakfast at 7:00 A.M., although many of them overslept and came late, or even missed it completely. Right after we finished with breakfast, we went to work setting up the tents, with one group of members and candidates going to the Staff City, the staff campsite, and the other group going to other sites. While we worked to set up the heavy tents, the rain made it a lot worse, mainly because of how muddy the ground was. Around11:00 A.M. was the brotherhood ceremony, which I can’t say anything about, but we watched it and then proceeded to have lunch. Again, after lunch, we went back to the tent setup, which Staff City was almost finished and the other group was making their way around as well. When we came back from lunch, we had to carry wardrobes for the staff tents because of how long the staff usually stay there. After we finished off Staff City, we went through all of the scout campsites and set up the canvas tents until 4:00, when it was time for us to clean up, shower, put our Class A’s on, and get ready for dinner. After dinner, there were the Ordeal ceremonies, a Lodge meeting, which is basically plans for the year, and finally, a cracker barrel, which is basically a snack bar. Although I left before the Ordeal ceremonies, this was a great way to participate more in the Order of the Arrow and provide more cheerful service to the community. The morning rain drizzles on us as we gear up in wet suits to face against the rapids of the mighty Youghiogheny River. We hike down towards the river where the guide explains to us what to do in any scenario. We then carry our rafts down to the water and set off on the adventure. “Entrance,” our first rapid, tested us at the start to prep us for what lays beyond. Each rapid had its own unique feature. During a rapid a wave might tower over your head. Although, most rapids were challenging there was only one “Railroad.” That was the one that knocked me off of the raft. We had just finished the first half of “Railroad” and our raft got slammed by a wave on the right side where I sat. Another boy and I were pushed off the raft. Later, after we were done rafting and took off our soaked wetsuits, we had lunch and looked at pictures of rafts. Then we headed back to camp to take a nap, stand by the fire, or cook dinner. Rafting is a great experience, and is by far my favorite campout. It was great, and everyone should try it. This is what I will be looking forward to next year, I will be going and I hope you are too. The registration is open for the 2017 Jamboree to be held July 19-28, 2017 at the Summit Bechtel Family National Reserve in West Virginia. This is the permanent home of the Jamboree. The cost is $1,475, which is slightly higher than the 2013 Jamboree though commensurate with this type of high adventure base activity. This past year of Scouting has been very fun. Here are some of the events we did in 2012 as seen through the eyes of a Troop 88 Scout. The first night the whole group went to the first camp sight. That morning the group split into two separate groups, the long 15.5 mile and the short trip. The long trip was exciting with dramatic vertical climbs and drops. Our first stop was for lunch at a look out. It was an amazing sight to see, I wish the short group could have seen it. The only water at the lunch stop was at the bottom of a slanted incline that was 1.5 miles long. I call it “the hill of a thousand steps”. The water trip was worth every step. Then we hike to a resting spot for the night. We had to go down a windy hill that was 1 mile long. Our final leg of the hike had the best for scenery. We could see the Appalachian Mountains the back ground. We hike this part so fast we got home 2 hours early. This trip was a great trip and I had a blast. 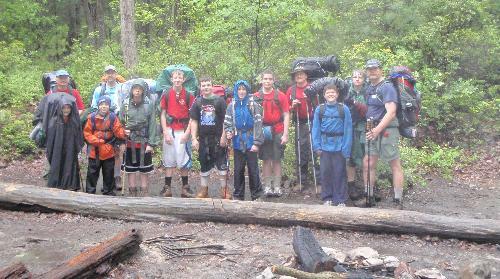 On May 18th through the 20th the troop went on a backpacking trip along the Appalachian Trail. My group went on the shorter hike and had a great time. After we set up camp and put up the bear bags Friday night we had a fire and went to bed. We slept under the stars with only a tarp and a sleeping bag, we could only do this because of the nice weather we had on the trip. Then on Saturday we woke up and the long hikers left and we left soon after. On our hike we saw many great outlooks with amazing views and some great resting areas along the trail. On the one outlook, we could even see the road that we drove on to get to the starting point in our adventure. Saturday when everyone reached the camp that we were staying at we set up camp and had dinner. This was nice because we got there early and had a lot of time to have fun and relax. Then on Sunday, We got up again and hiked about a mile to the end point of our adventure and relaxed while the adults walked some more to get the cars and then started our way back home. Summer Camp 2012 was just as great as all of our Summer Camps. I think we all had fun with camp activities and with our merit badges. We participated in a lot of camp activities like the Cast-Iron Chef Cook-off, and the cardboard raft we built for some race, thing. Most of us got all of our merit badges, and only a few of us got partials. Sure there was a little bit of rain one morning, but we got over that quickly. I think that we all enjoyed Summer Camp this year, and I hope that next year’s Summer Camp goes just as well. One of the best parts of Hidden Valley camp was getting the merit badge for finger painting. I liked it because it was the easiest merit badge to get and it did not take long to accomplish it. Another thing that I really liked was swimming and getting the swim merit badge, but I did not like the homework. However, the homework was easy :) I also liked blowing up my clothes in water because it taught us if someone became strained, one can use their clothes as a floatation device. My favorite meal was the breakfast burrito. I had 4 burritos at one sitting. It was sad to leave because all of the scouts had a great time and we learned a lot....Red Robin...YUM! We went to Putt's Camp in June. It was all in all one of the best campouts we have been on. The amount of activities to do was almost endless. The campsite where we stayed was right on the lakefront of Raystown Lake, with a pretty big field to have activities in. In the day during free time, most of the scouts fished, kayaked or canoed. Sometimes, we played ultimate Frisbee. We also enjoyed jumping into the water and swimming. One day, we even jumped off of a small cliff about 7 feet down into the water. At night, we had a campfire and played games like Manhunt and Ghosts in the Graveyard. Of course, we had to do our chores too, like cleaning out the fire pit on the first day, setting up dining areas and helping with meals. We cooked meals by patrol. The good part was the adults always made too much Dutch oven dessert, so they shared it with us. We also worked on rank requirements like navigating without a compass and making a useful camp gadget. Some scouts worked on merit badge requirements like first aid, communications and fishing. It was really cool to have our tents right by the lake at Putt's because we woke up in the morning to the sound of water. The cicadas were pretty loud though! We can't wait to go back to Putt's Camp and do more fishing there. Tom’s project, in Harrisburg, was to turn a large foundation into a flower garden for people to enjoy as they pass by on the Green Belt. To help Tom, we planted perennial bulbs in pots and painted the raised planter. Then we laid down rubber membrane to prevent weed growth and we used caulking guns to glue the pots to the rubber in a pattern. We then spread stones all over the planter to fill in the top. We had many scouts, parents and family members there to help with his project. It was a great project and we can’t wait until Tom gets his Eagle. When we were at Putts Camp in September, we had an awesome time! Out on the lake, we got to canoe and kayak, and some of us got to go out on Mr. R’s boat to go fishing. When the sun went down and it was dark we got to play a game of sharks and minnows. After the game we were free to do whatever we wanted to. Many people played with a Frisbee or football while other worked on merit badges and rank advancements. The next morning we broke down camp, ate, and left Putts Camp. We had a great time there. Hopefully we can go back soon. In the month of October 2012, our troop went to Hidden Valley to experience the Rendezvous activities. The scout reservation was packed with other troops so we shared a campsite with many troops. After we survived the bitter cold night, we made breakfast and headed out to the activities. There were many different activities from the tomahawk throws to fire building, to team activities to assisting a blacksmith make a dinner bell. My patrol did activities until late afternoon where we watched a helicopter land. At night we attended a camporee where we listened to music and watched a slideshow. Tired from a long day we fell asleep instantly. I think everyone had a great time. On a cold weekend in October, a bunch of scouts and scoutmasters went to the Field of Screams. We camped in a large open field at Wizard Ranch. There was a small cabin next to us, and it was very creepy because it was old and beat up. Late one night, we all got in the cars, and went to the Filed of Screams. There were three attractions. The Haunted Hayride, The Den of Darkness, and the Fright mare Asylum. I’m pretty sure every single person in our group screamed at least once during our trip to the Field of Screams. It was a great trip. I noticed a few new scouts added it to their list of best camp activities! Of all the campouts I have done so far this year, this is probably my favorite outing yet! We arrived on Friday as usual – set up camp, had a snack, and turned in. We had an early start in preparation for the hike that day. My patrol was going to be having tacos as lunch that day on the trail, but we knew that cooking them in such a small camping stove would be no easy feat. I thought it would be best to cook the meat itself at camp, and warm it up when we stopped for lunch. As we set off on the trail, the temperature was mild for a fall day, and most of us set out with heavy layers and under-armor. At merely twenty or so minutes into the hike, many of us were already drenched with sweat, and the temperature showed no signs of dropping below the sixties. For those with good packing skills, we stuffed our coats and sweatshirts into our hiking bags during one of our early breaks and pressed on. The scenery was gorgeous, and the weather could not have been more perfect. Sun was shining, and a breeze was gently rolling. Lunch was even tastier after a long morning of hiking. We broke for lunch around 12:30 or so near a service road. Meals ranged from boil-in-a-bag ramen to taste bud simmering tacos (like my patrol!). Afterwards, we cleaned up and prepared for the return trip (thankfully, mostly downhill). Without the food weighty us down, the group traveled a bit faster overall. At one point, the scoutmasters began to worry that we would not make it back down before dark – as fall brought shorter day and cooler evening temperatures. The pack made double-time, and we reached the end (or truly, the beginning) of the trail and back to the campsite. We made a few nice stops along the trail to enjoy scenery, and overall had a great time! Hiking has always been a favorite of mine! Troop 88 participated in Scouting for Food in November; this is a Council wide effort to collect food for families that need it. As a reward for helping we went to the Climbnasium for an afternoon of fun. We invited some local Cub Scout Packs to Join Troop 88 on this outing. The Climbnasium is an indoor climbing facility with a variety climbing selections and walls up to 40 feet in height. We started the event off with a pizza lunch for everyone. Then we got fitted for harnesses and helmets and started climbing. Some of the Scoutmasters belayed, holding the ropes that kept us from falling of the big walls. If you got to the top of the highest wall you could sign a book to let others know that you made it. There were other areas that tested you in different ways like free climbing and places where you were hanging upside-down. It was a lot of fun I think everyone had a good experience. In December on our trip to Maryland, we saw many interesting things. The Naval Academy was a huge place full of information, so big it has it’s own zip code. We saw a replica of the copy of the first Wright Brothers plane. We saw John Paul Jones’ resting place and learned of his life. We also saw the Maryland State House, the place where the resigning of General George Washington and where the Treaty of Paris was ratified to end the Revolutionary War. On Sunday, we went to Fort McHenry, where we learned of how the National Anthem came to be. We toured the fort and learned how men at the fort just hid all night and fired back and defeated the British. This year the scouts and the scout masters have been very busy with outings and helping out our community. The first outing of the year was the annual cabin campout, or winter camp. Everyone who went had a great time learning skills and also playing the competitive yet very fun football game between both cabins. Nobody got hurt and everyone had a great time. Next was our other annual trip to Hidden Valley for the Klondike derby, which was very cold and of course there was a lot of snow. Everyone had fun competing against other scouts and practicing our scouting skills. In May the scouts went on a very long bike trek over a weekend. Along the way it rained and they had to bike through the mud and rain. This trek was so long they had to set aside smaller biking treks to get ready for this one. I also heard they had an amazing time. In June the troop went on a new outing which was the anything that floats trip which means that some scouts brought tubes and some brought canoes and kayaks. They could bring anything that could float, hence the name of the outing. They floated down the Conodoguinet creek. They rafted all day and some of the immature ones like Mr. R, our Scoutmaster, brought along squirt guns and got everyone wet. In July, We went on another annual trip which was summer camp, everyone had a great time. This year we went up to New York to Camp Barton. We got lucky with our camp site because at first they did not have another camp site for us so they put us in an open field right next to the water front and the lake. The only bad thing about our week long trip was the big thunder storm in the middle of the week. In the middle of the night, we all got woken up by either the roaring thunder or by Scoutmaster coming by and waking us up and telling us to go into the nature lodge for safety reasons, because we were in the middle of a field with metal poles. So we all got out of our tents and ran into the nature lodge soaking wet, and then the other Mr. R, with his iPad looked at the weather and we saw that right over top of where we were was a big blob of purple storms, which are possibly the most dangerous. After the storm we went back to our tent to see that many of them were flooded and the canopies broken. In September the troop went on a camp out at Shawnee camp, we also wanted to go to Shenksville and see the new flight 93 memorial, which was incredible. There were so many pictures and many flowers and people praying. This was a fun camp because we all basically got to do whatever we wanted. We got to go out on a lake and canoe and kayak and some of us went fishing. I do not think that anyone caught anything but we all had a great time. In December the troop went to Pittsburgh, PA, along with the trip to the city, when we got to Pittsburgh we rode the Duquesne incline which gave us an amazing view of the whole city. Thanks to Mr. W we got to go to into the PP&G building and he showed us around. After that it was time for lunch and of course we were in Pittsburgh, so we went to Promanti Brothers for some amazing sandwiches. As you can see the Troop has had a busy schedule of activities. There were many opportunities for Scouts to find something that they really enjoyed. I think that the Troop had a successful year with outings and am looking forward to more fun adventures next year. This past year of Scouting has been very busy, yet very fun at the same time. We have been on many outings, with some very interesting encounters. In January, we went snow tubing at Ski Round Top. It was a great night for this, because the lanes were very slick and perfect for hitting high speeds. In February, we took our annual trip to Hidden Valley for the Klondike Derby. It was freezing, and it didn’t help that we had snow up to our knees! A few weeks later, we went on a ski trip with another troop alongside us. They were very nice, and helped us out with our gear. April was the troop’s trip to Pinchot Park. This was a fun outing because we got to go Kayaking out on the lake. May was a favorite outing of mine. It was a unique backpacking trip that started out just like any other. We were given the choice to cancel it due to heavy rain and thunderstorms, but we decided to go. On the second day we arrived in camp to find a rattlesnake. That night it rained like never before, it was so hard to sleep. In the morning, we found that the tents at the lower end of camp had flooded and I felt awful for the people inside them. Of course, we then went to McDonalds afterwards for breakfast. June was our trip to Summer Camp which is the longest outing of the year. It is usually everyone’s favorite and it seems to get better every year. The main objective is to earn merit badges. Luckily, most merit badges are fun and there aren’t so many boring ones. July is the High Adventure Trip, which is only for the scouts that are fourteen and older. It changes location every year, and from what I hear, you go to some pretty neat places. In August, the National Jamboree was held in Virginia where you can meet scouts from all over the country. The next month was the Council Jamboree in Hershey Park, so we only met scouts within our council. In October there was an outing to The Lincoln Caverns where we took a spooky ghost tour. A few weeks ago, we had an Aeronautics event in the field next to the church where we shot off model rockets. Unfortunately, a few people lost their rockets on the first launch, including me. Our next outing will be to Baltimore, where we will tour the aquarium and stay overnight on a Coast Guard Cutter. It should be lots of fun. I would like to invite any boys, between the ages of eleven and seventeen that are interested in joining scouts, to attend a troop meeting whenever they like. Lastly, I want to wish everyone a Merry Christmas and a Happy New Year.